Both of these projects use a foundation paper pieced block based on the Crown of Thorns block. Either makes an excellent project for someone new to paper piecing. 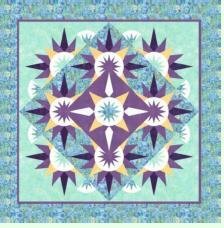 They cover many of the basic Quiltworx techniques without involving a significant number of blocks and include papers for multiple projects. If you are looking for a quick project where you can have a great time choosing your fabrics, this is an excellent option for you.